Stone's Mansion, formerly known as 'Old Nichols Mansion,' was completely remodeled inside and outside from 2007 to 2008 and again in 2015 to 2016. Stone's Mansion with over 9800 + sq. ft. of living space and over 3500 sq ft of covered decks. It features 7 bedrooms, 7 1/2 bathrooms, including two King master suites with baths, 1 King Bedroom w/ bath, 2 Queen suites with baths, 1 Queen bed with shared bathroom, 1 Bedroom with 2 fulls size beds and 1 trundle bed with shared bathroom, 3 Sofa Beds, 2 inflatable beds and will comfortably sleep 24 guests. The main floor has a king master bedroom suite and bath. There is a large fireplace with hearth and mantle, and a 55' HDTV. In the bath there is a step up jetted tub, a walk-in double shower with two large shower heads, and a huge walk-in closet, and a washer and dryer. The living room contains a floor to ceiling stone fireplace with hearth and a 55' HDTV. The dining room has a large cherry and marble table which seats 10. The bar area and breakfast nook seat 13. The kitchen is equipped with two commercial Viking refrigerators along with a double commercial Viking gas stove, which would be the envy of any chef. From each one of these rooms the wall to wall windows show a view of the lake for miles. Going downstairs, you enter into the wine room with a bar, small refrigerator, game table and sleeper sofa. Also located on this floor is a media room, full bath, large family room, game room (with a Champion shuffleboard table, Foosball table, a full size pool table, an electronic game machine and full kitchen with another breakfast nook that seats 10. 1 bedroom with 2 full size beds and a trundle bed, shared bath. There are several covered patio areas, perfect for celebrations. (Over 3500 sq. ft. of covered decks). There is also a large private swimming pool Enjoy the sun and the water, as well as a grand view of the Lake. Follow the cart path down to the lake shore and have a picnic in another secluded area by the shoreline. Take a few steps or walk down to the dock to go swimming, fishing or take your boat for an afternoon drive. Lake of the Ozarks has long been noted for its hundreds of miles of privately owned shoreline and has been the Midwest's premier vacation spot. 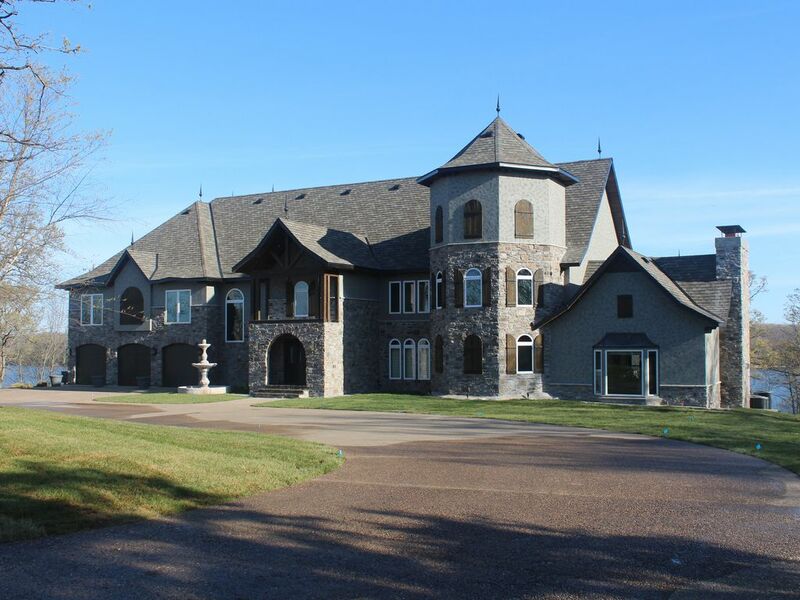 Stone's Mansion is one of the few large homes for rent in Osage Beach. It is located less than 2 miles from two very popular golf courses, and approximately 4 miles from the Outlet Mall and many other shopping areas and popular restaurants. 1 standard stainless lower level kitchen with dishwasher, ice maker, refrigerator, glass top stove with granite countertops throughout. runner slips, sunning area and diving ladder. IF YOU WISH TO RELAX, ENJOY A FANTASTIC VIEW, LIKE TO GOLF, BOAT, SWIM, PICNIC, FISH, OR LIKE TO HAVE FUN SHOPPING AT THE OUTLET MALL AND MANY OTHER SHOPPING AREAS AS WELL AS ENJOY EATING AT FINE RESTAURANTS, YOU WILL ENJOY YOUR STAY HERE AT STONE'S MANSION. WE ARE LESS THAN 10 MINUTES AWAY FROM ALL ACTIVITIES. SEE YOU SOON! (3) 2 Viking commercial refrigerators plus 1 stainless steel refrigerator in the downstairs kitchen, small under th counter refrigerator in the wine room. We have limited ramps available for 1st floor access only. The mansion also has a wonderful Theater Room with awesome surround sound, a dock like none other on the lake, with a huge swim platform and diving ladder. Thank you Larry! Always enjoy you family as guests! Property is beautiful, spacious, and well managed! I would recommend to anyone! Thank you! And we do enjoy having your family! Stone's Mansion is the most accommodating place in the Lake area for my group. the group is comprised of about twelve guys in our sixties who have been coming to the lake on a golf outing for several decades. We especially appreciate Marty and the entire staff who make everything easy for us, from reservations to arrival and departure. Amazing place with great view and ammenities. Our wedding weekend was absolutely perfect at this venue. Great layout, bedrooms and bathrooms aplenty. Everything was beautiful and the amenities are too notch. Thank you to Theresa and Marty for their help! Stayed over the Christmas week with extended family . Worked out great weather was good!! House is huge and they will provide every possible amenity. Everyone loved spending time in the hot tub. House is well updated and views of lake are stunning. Thank you! Would love to have your family come back anytime! Beautiful an ideal place to have a family get together. Swim take a dip in the hot tub and repeat at least thats what the kids liked best. The adults loved the view and all the decks on the house. Having all those wash machines and dryers was hit for keeping the towels clean and dry. The cart was great for getting to the dock. Only complaint was to many small steps from area to area. Very easy drive to the house and plenty places to park cars. We will be back and other family members that were not here are making plans to rent this property.